Hog Riders are the number one strategy in my opinion at both Town Hall 8 and Town Hall 9. Hogs are great for using in war to grind out the three star! However, between the two THs, the strategy changes infinitely, so you’ll need two separate guides! For Town Hall 8, all you need to do is straight up hog the base! First off always lure away the Clan Castle to kill or to poison spell. There is no need to take care of the king. Afterwards you need to send in your hogs in 2 lines heading towards 2 separate defenses. Once these hogs get low on health, put down your heal spells. Also remember to put down your clean up troops as your hogs rip through the base. Hopefully, you’ll have hogs left over at the end of the raid to help you clean up the rest of the buildings. Obviously, the number one thing to avoid with hogs are double giant bombs. Scout the base before you attack it and look for any 4×2 spaces where double GBs could fit. Also, try to prevent your hogs from all going to the same defense; they need to be spread out. Lastly, you need to make sure that the entire CC is lured! Count out 25 troop space as it comes out! At Town Hall 8, heres what I would bring in order to get the three star! At Town Hall 9, using hog riders is a bit different than it is with TH8. When attacking a fellow TH9, you need to worry about taking out the queen, prompting a new GoHo strategy. In GoHO you use 1-2 golems plus your heroes and a few wizards to take out the queen and the clan castle troops. So you first need to send in your golems with some wizards behind to clear the buildings. Next come the heroes, which should have a clear path to the queen and the approaching CC troops. 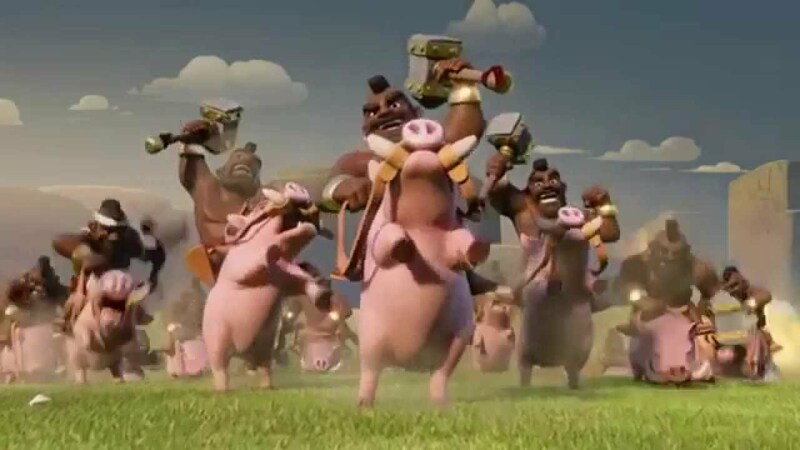 After those fall, send in your hogs and repeat the strategy from TH8. Once again, the number one obstacle to avoid are those pesky double giant bombs. However, you must make sure that you take out the queen or else your raid will not be a three star. Make sure to choose the most clear path to the queen. So that’s your guide for hogs at TH8 and TH9! Make sure to comment below if you’d like to see any guides, articles, or videos! Thanks for reading! ← March: Global Release of Clash Royale! 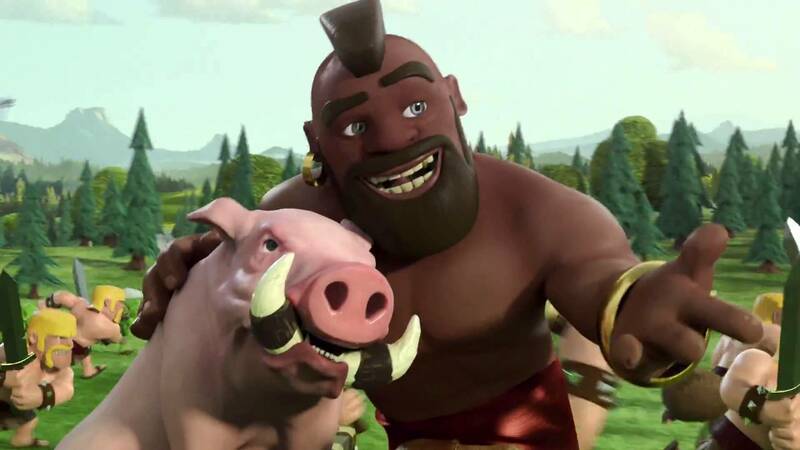 Pingback: Quick Guide to Succeeding with Hog Riders | Clash of Clans Guide, Strategies, Tricks and More! The King and Wizards come in to help clean things up. Try using some riders next time, if only for a change of pace. Also, you forgot to say double poison (one trained, one from CC) for both town hall levels. But that is kinda obvious anyways. Hogs are good at town hall 7 as well, even though they are only level 2, you have the same amount of heal spells as town hall 8, and there are only 2 giant bombs to avoid instead of 3. I rarely used it at town hall 7 though because they are expensive with only one drill in your base to replenish your DE. Also, can you do another review on my bases? I got to town hall 8 on my main account a while ago, and town hall 6 on my second account last month, and I have made new base for both town halls. I have my trophy bases on for both accounts (and I discovered that trophy bases and war bases are not completely the same thing, and these two in particular are for trophies only, not war). I switched to another friend’s clan called Badatclashing, and the account names are Daniel_H212 and Daniel_H212_2 respectively. I’ll try to get you in soon!